Travel Story Penguins in Antarctica: "Happy Feet suddenly feels more like a documentary"
People are not to approach closer than 5m to penguins. But no-one told these little chaps that. Is there anything funnier than a penguin slipping over on ice? I watch one coming down the hill overlooking Paradise Bay on the Antarctic Peninsula — it slips and falls beak first into the snow. “What’s with that,” I think. It gets up, shakes its head from side to side then sets off, and slips over again, falling so hard that it dives right under the soft snow. This is a gentoo penguin, which is the species of penguin mostly commonly seen on the peninsula (I am reliably informed by the One Ocean Expeditions naturalists aboard that the crabeater seal is the most populous marine mammal on the planet, as there are many millions of them). It is estimated that there are 300,000 breeding pairs of gentoos, more than 30,000 of them on Cuverville Island, off the west coast of the peninsula. I am here in March, when chicks are big but still demanding food and birds are moulting. They sit, to my eye looking rather forlorn, a fluffy mess surrounded by fallen feathers. At Hannah Point, on Livingston Island, in the South Shetland Islands, the beach is scattered with dead penguins upon which skuas feast. And here there are also chinstrap penguins. Gentoos have a bright orange beard and white flash over the top of their black heads, and chinstraps a narrow black band under their heads that makes them look rather like they are wearing a helmet. Both live mainly on crustaceans, and primarily krill, but also small fish. Gentoo penguins at Mikkelsen Harbour. Gentoo penguin at Cuverville Island, Antarctica. Gentoo penguin at Paradise Bay, on the Antarctic Peninsula. Gentoo penguins at Mikkelsen Harbour, Trinity Island. Hut and gentoo penguins at Mikkelsen Harbour, Trinity Island, in the Palmer Archipelago. Gentoo penguin at Mikkelsen Harbour. Whales are one thing, seals are another, but to spend time with penguins in Antarctica is a treat. The best thing to do is sit down in the snow and just watch them. 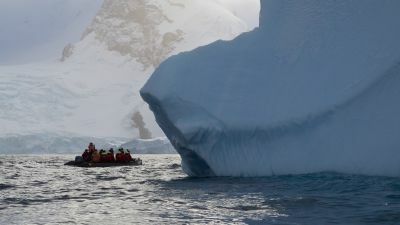 The International Association of Antarctic Tourism Operators, of which One Ocean Expeditions is a member, has strict guidelines. No more than 100 people can land at any one time (capable of carrying fewer guests than that, this means that on the smaller ice-strengthened ship Akademik Sergey Vavilov, which One Ocean uses, everyone can get off all the time). People are not to approach closer than 5m to penguins. But no-one told these little chaps that. In the soft snow of Cuverville Island, one comes up to that 5m boundary, stops and looks around, spinning its head on its plump little body, and then (almost as if he’s checked no-one is looking) comes right up to me to say hello. He pecks a little at the waterproofs in which One Ocean kits all their guests, and then turns, and settles next to me, surveying the scene, just as I am. The film Happy Feet suddenly feels more like a documentary. It’s time to go, and I get up from the ice ready to move, and my companion stretches ready to do the same. And then I slip over one way, and he slips over the other.